The AU Mic debris disk as viewed in optical light (scattered from dust in the gas) is shown in color. The observations from this paper, at millimeter wavelengths, are shown as black contours. The location of AU Mic is marked by the red star. Figure 1 from the paper. And indeed, debris disks have been observed around some of the moving group members. You might have heard of another moving group member called beta Pic: it’s a well known example of a star with a circumstellar disk and a directly imaged planet, confirmed in 2009. 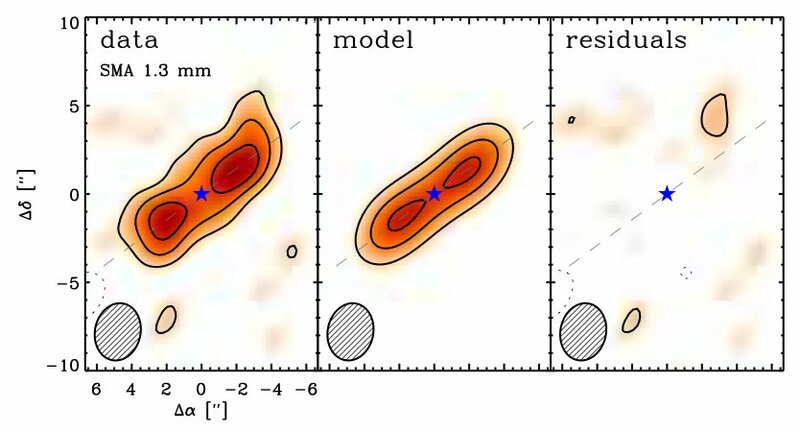 A debris disk has also been observed around AU Mic, which is the subject of this paper (although evidence of an orbiting planet has yet to be seen). The AU Mic debris disk is similar to that of beta Pic in orientation – both are viewed edge on – and surface brightness profile – shallow inner slope, steeper outer slope. AU Mic’s disk is both smaller and less massive than beta Pic’s. Wilner et al. begin by discussing the theory behind debris disks, which they note was inspired by beta Pic and AU Mic. The origin of the debris disk is a ring of planetesimals, rocky boulders that may eventually build up to form planets. The planetesimals collide, producing dust grains of various sizes that become segregated: small grains are blown farther out by stellar winds and radiation, medium-sized grains are pushed to eccentric orbits and large grains remain in place and are gradually worn away. There is some evidence of the planetesimal ring in the debris disk around beta Pic, but previous observations of AU Mic haven’t had high enough resolution to probe the structure of its debris disk in this detail. In this paper, Wilner et al. present high angular resolution images of the AU Mic disk that hint strongly at the existence of a planetesimal ring. This work uses the Submillimeter Array, a radio interferometer, to observe AU Mic’s debris disk at 1.3 millimeters, which makes their observations sensitive to thermal emission from millimeter-sized grains. Although that might sound small, grains this size actually fall into the “large grain” category and are therefore expected to remain in location near the planetesimal ring from which they were produced. Wilner et al. then fit their data to a simple disk model. Although the data isn’t high enough signal to noise to fully constrain the disk properties (for example, the density gradient and extent of the disk are degenerate), the best-fitting models give consistent results with respect to the disk morphology. 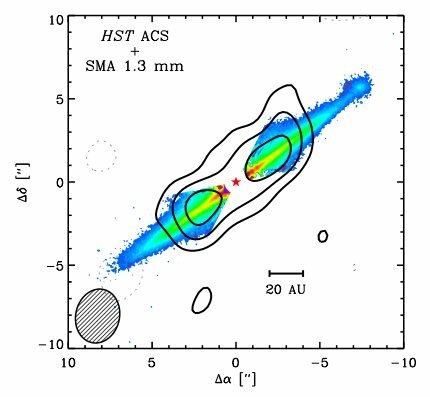 The authors find that the 1.3mm emission, and thus the spatial distribution of millimeter-sized grains, is best fit by an annulus centered 35AU from the star. If the debris disk theory is correct, this indicates the location of the planetesimal ring in AU Mic. The AU Mic debris disk imaged at 1.3 millimeters using the SMA. The left panel shows the data, the middle panel shows the best-fitting model and the right panel show the difference between the model and the data. Figure 2 from the paper.